Writing my first book had many parallels to vegetable farming—especially growing onions; and legal battles—like with the Koch brothers. If I think about the entire process, from farm dream to food on the table—access to land, learning skills and developing markets, buying supplies, HOEING; or what it will take to win in a court of law against the largest privately owned company in the world—if I focus on the gazillion details; it’s overwhelming. I just want to quit. If instead I hold the larger vision in my mind and heart—the reader’s needs and the higher good I aim to accomplish—than I can stay in the moment and present stage of writing. Early on someone told me that to finish a book it is necessary to believe that the world needs what I have to say. I fought this idea until I accepted it doesn’t have to be true—I just need to believe it. So I made a commitment. I stood before a mirror, put my hand on my heart, and promised. I, Atina Diffley, will write that which is burning inside me and the world is waiting to read. Believing in ourselves is the most powerful thing we can do. When I sit down to write I thank my inner critic—her name is Sylvia—for all she’s done, and I assign her the role she has in my present work. During free writes she is sent on vacation. While line editing she is appointed the responsibility of “specific” and “constructive” feedback. If she’s having a bad day and insists on self-defeating criticism, or her ego is raging out of control offering talk shows with Oprah—I send her packing. So I told, which was terrifying, but it became easier and the book dream became more real each time I said it. I also “scheduled” writing time on my calendar in ink. Pencil is used for other entries. Writing time is not negotiable. The first six months I wrote unedited “Islands” as Loft instructor, Mary Carroll Moore, teaches in How to Plan, Write, and Develop a Book. I used two rules. Rule 1: When character, location, or emotion changes—it’s a new island, and a new document. Working without an outline allows my sub-conscious to free associate. Memory and emotion are not time linear. Writing islands surfaces others. I jot them down for future work and go back into the island deeper. Thus I always have material waiting. Rule 2: Write 300 individual islands before creating structure. I would meditate on a scene until I could feel it and then pour out the story focusing on imagery that included all of the senses. I also learned that this is a private stage. Few people have the skill to provide helpful feedback on unedited writing. It is important to just write, write, write, and get it out raw. Trust the process. Trust yourself. The next step was the hardest for me—putting the islands in order. Mary teaches storyboarding in her class, which worked for others, but I needed something more tangible. Finally I printed every island and sat in the middle of our living room with them circled around me and shuffled the order. This took five excruciatingly long days. During this process my intuition would tell me certain islands belonged together. I couldn’t always see it but learned to just do it anyway. It was truly amazing and completely cathartic to discover the inner story and message of the book as I then knit the islands together. The questions I answered during this stage were: What happened? How did I feel then? How do I feel now? This is when the three-act structure began to make sense, and I learned how to manage narrative and emotional arc. At this point I didn’t need much self-coaching anymore. I knew I would reach readers and that the world needed my book. Sylvia was living semi-permanently, but on-call, in the Bahamas. I took LOFT classes and learned the difference between revision and editing and the craft that I needed. The writing went semi-public as I asked carefully select reviewers for feedback. Eighteen months from the start I had Turn Here Sweet Corn: Organic Farming Works and the University of Minnesota Press. On April 5, 2012, my journey from book dream to published will be finished. I invite you to join us as we launch Turn Here Sweet Corn into its public life and personal relationship with readers. 1011 Washington Ave S, Mpls. MN. I am nearly done with your book, and have loved every bit of it, even though parts of it made me very sad. I found this blog when I went online to purchase more copies for family and friends. I am not a farmer, but I am a dedicated customer of organic produce and a citizen passionately concerned about the dangers presented by genetic modification and the use of herbicides and pesticides. As such I am so appreciative of your sharing your story, as I am appreciative of what you are doing. Thank you for your book, your work, and your example! The world DOES need what you have to say. Thanks for reading and writing Carol. I’m finding facebook to be one of the best promotion tools. If you have a page and would like to post it with a recommendation here is a link you can use. 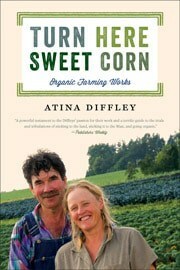 https://atinadiffley.com/purchase-promote-turn-here-sweet-corn/ Thanks again for your commitment to a world that protects land and nature. I also just finished the book. It is so unique and nourishing on so many levels. I find myself constantly studying farms as I drive by, with new eyes. I tell others: do you realize all the hands that have gently handled your food on the way to your table. And I long for enough sun to try growing such spectacular broccoli as you do. Thank you for this blog and for describing how you constructed your story and brought the book to life.